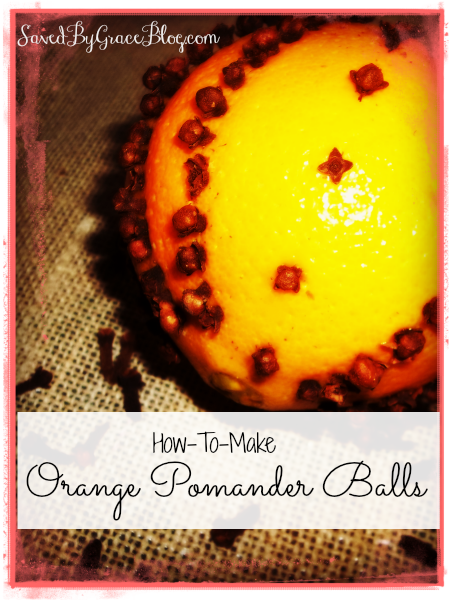 One of my favorite things to make during the holiday season is Orange Pomanders. They smell amazing and are a great relaxing craft anyone can do. I think the scent really warms up any home. With oranges on sale this week, I decided now was the time to sit down and bring this memorable fragrance in my kitchen. The most expensive part of making Orange Pomanders is the whole cloves. If purchased in a jar, they cane run you between $4-$6. In bulk, it is half or less of that so I suggest you purchase that way. You only need about 1/4 cup (or less, depending on the design you plan on doing on yours) of them per orange, so they are not extremely expensive and this whole craft can cost you less than a dollar per orange. Orange Pomanders last a couple weeks if hung and get more fragrant as they dry out. Most pomanders last between a month to several months if allowed to properly cure and dry. It is a good idea not to keep them in a room such as the bathroom where they will be exposed to too much moisture. Start by envisioning your design. You can do elaborate designs, or stick with something very simple as I did. The more cloves you stick in your orange, the more fragrant it will be. Make small pokes into the orange to make inserting your cloves easier. Stick the pointed end of the cloves directly in the orange. Do this until you have the design you want. You can attach a ribbon to your orange by threading it through with a large needle. Make sure to go in deep enough to the meat of the orange so you have a good amount of the orange to stick with to prevent falling. Hang and enjoy!